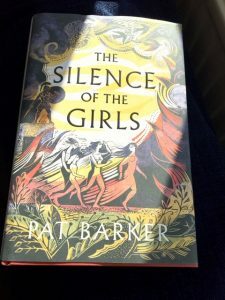 This entry was posted in English Literature and tagged Achilles, Agamemnon, Briseis, Pat Barker, Patroclus, The Regeneration Trilogy, The Silence of the Girls, Trojan War by Simon Lavery. Bookmark the permalink. I’ve only read one of Pat Barker’s books, Toby’s Room, which isn’t considered to be one of her best. It didn’t go down terribly well with our book group when someone chose it as a WW1-themed read, probably partly due to the fact that that it’s actually a sequel to an earlier novel, Life Class., which most of us were unfamiliar with.) Anyway, this new one sounds much fiercer and more accomplished. I think it was serialised on R4’s Book at Bedtime a little while ago. I haven’t read your review because I have (of course) bought the book, but I will come back here when I’ve read it. I’ll be interested to read your views on it, Lisa.